On the Isle of Anglesey at the north West tip of Wales lies the beautiful seaside town of Beaumaris. 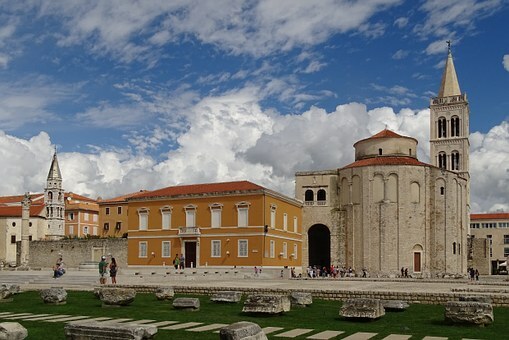 It has a fabulous castle, a jail, a pier, walks, runs, galleries, cafes and shopping (to name a few), but, if you're that way inclined, it also has a location where you can go get your face melted off. And who doesn't want to do that on a crisp Saturday morning in October? No one, that's who. 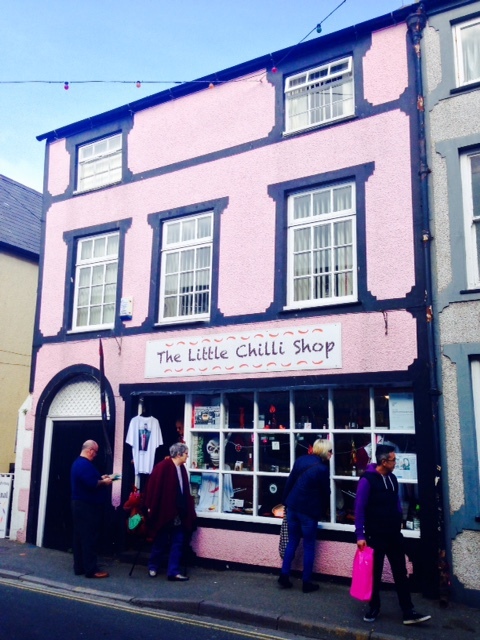 Sitting, unassuming, on Church Street, with its pretty pastel pink façade and it's very friendly (and not at all fierce looking) cuddly dragon guarding the door, The Little Chilli Shop quietly entices innocent passers-by into its spicy realms with the promise deadly heat. Not literally deadly, you understand, but figuratively speaking. No harm will actually come to you by visiting the premises. Or will it...? 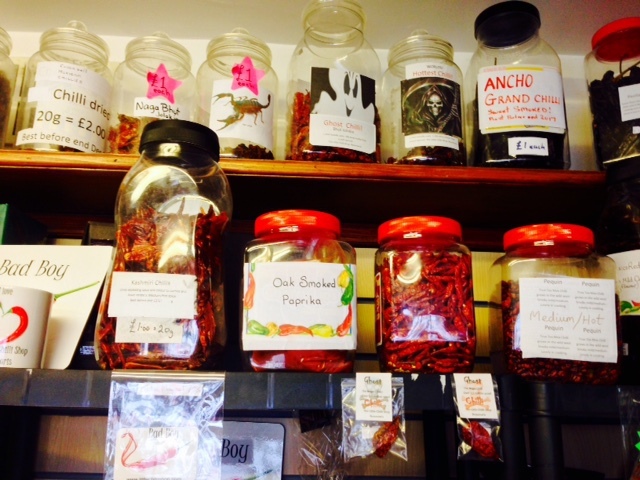 This gorgeous little emporium is stacked from floor to ceiling with an eye-popping array of chilli from around the world and also has homegrown beauties Welsh beauties, which blew my own kitchen garden attempts right out of the water. And mine were pretty hot. 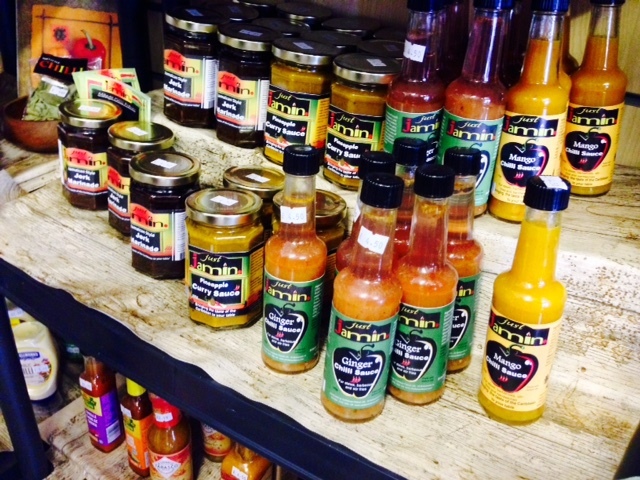 The shop is the brainchild of owners, Tim and Suzanne, who obviously quite like spicy food and want to share this love with the good people of North Wales and beyond. Walking into the store was my idea of Heaven. I am the woman who orders vindaloo curry and always, ALWAYS gets a bit of side eye from the waiter who wants to check if I really know what I'm doing. Finding a shop that stocks so much chilli that it makes vindaloo look like vanilla ice cream is clearly somewhere I need to be. There are dozens of jars and tubs across the shelves, reminiscent of an old curiosity shop and, as well as selling the raw ingredients, the guys also produce their own range of award winning products. These are all packed in eye catching jars with fiery red writing and some of the best names I've ever seen. The couple even go as far as to tag some of their brands under the label 'hot stuff' - like it's not ALL quite spicy. This stuff is clearly not for the casual chilli eater...this is for those with a constitution of steel and a passion for watering eyes and running noses. In other words: me. A chilli sauce called 'Bad Boy' informs you that it'll heat you up, whilst 'The Beast' chilli sauce is potent from across the room, and will almost certainly separate the experienced from the, quite frankly, weak. These people are commonly, in my household, known as 'Husband". I very much like to think of myself as someone who could handle The Beast, so to speak. 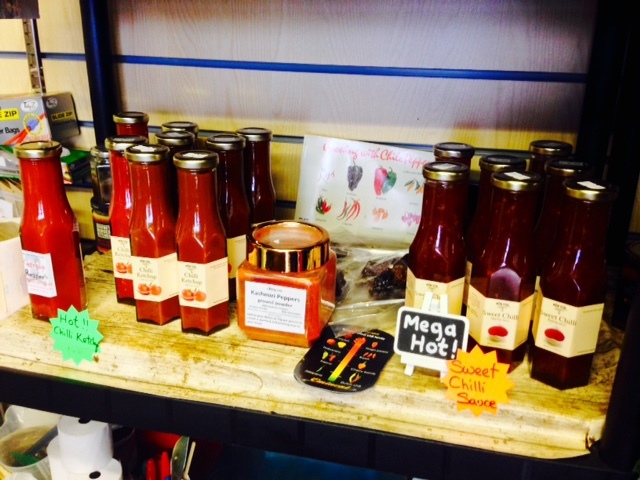 As well as sauces, the shop does a range of chilli jams (I'm going to stop mentioning chilli now because I think you probably have the gist of the main ingredients...), ketchup, mustard, a range of pickles and chutneys (including a fabulous beetroot pickle). Basically, if you can put chilli in it; they've got it. What the owners also have is a lovely tasting plate. This lets you (if you're brave enough) try the produce before you buy. Some of them are mild and others are...well, the furthest thing away from mild that you can possibly think of. While I was in the shop, I was standing behind a Scottish tourist who had just tried a tiny amount of something that should, evidently, have come with a warning, as she could hardly respond to me when I asked her if it was hot. In the end, she just nodded her head and went outside, presumably, to drink large volumes of water from the Irish Sea which is helpfully situated just a street away. As I left shortly afterwards, I bumped into one of the owners, who was coming back from town with a tray of chilli chocolate, which looked amazing. I thought it rude to mug him in the street, so I left him be. I'll be back, though. If you love all things hot and spicy, this little treasure is well worth a trip across the bridge for.